A message map has the unique advantage of visually representing your key messages in a concise format. Thus, it can be used quickly and is easily understood to create alignment and put effectively into use. It becomes a template for advertising, website copy, and conversations. And message mapping can be used for all types of audiences. Message maps can also be created for specific circumstances, such as communication during a crisis or organizational change. Message maps are effective for these purposes, but are also fundamental for everyday situations, such as answering common questions, setting expectations, or clearly communicating differentiation and managing expectations. 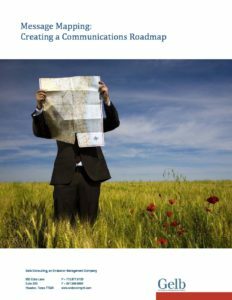 In this paper, we review the process of message mapping and tips for implementation.